Looking for a gift for a doctor or nurse? 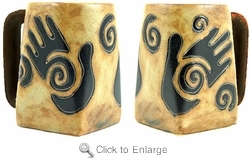 This Healing Hands Square Bottom Coffee Mug is another design by Mara. She placed a variation of this design on her 16oz Round Bottom mug Healing Hands. So you have choice for that special someone.